In the spirit of transparency, I should admit that I am a huge David Lynch fan. So being invited to spend the day with him, discussing his process and his past while watching him work, would be a dream come true. 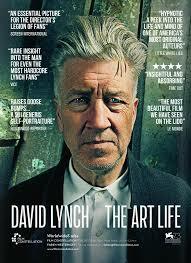 DAVID LYNCH: THE ART LIFE provides just that. In his sun-bathed Los Angeles art studio, the documentary follows Lynch through a day of creation. Much like Lynch's life, the rich visuals are filled with canvasses and paints, textures and tools, cigarette smoke and dirty fingers. Despite the film being an insightful look at a man who has made his name as a filmmaker, there is not a single clip from any of his feature films. Instead, directors Jon Nguyen, Olivia Neergaard-Holm, and Rick Barnes marry family photographs and home videos with Lynch's own paintings, sculptures, and music, all narrated by the artist himself, giving his own oral history. The elusive Lynch has always been against overexplaining his art, and instead of directly discussing the meanings behind his work, he discusses the journey he took to become an artist and shares personal stories that have informed many of his themes and images. It's not so much a straight biography, though there is plenty of by-the-numbers info on Lynch's early life. The stories that have been included are the one that most directly explain his process or his inspiration. It's more of a meditation on what it is to pursue art and how the things we feel and experience seep into that work. The film is almost a code book to the mind of Lynch, and as such, it's probably far less satisfying if you aren't familiar with the artist and his most potent and recurring ideas. This look into Lynch's past ends just as he is completing his first feature film ERASERHEAD, just before he left his first permanent mark on American cinema. It's an unconventional choice that further asserts that the filmmakers here are less concerned with Lynch as the legendary director, and more concerned with Lynch as a man, a mind, and an artist. With a subject who has always been fascinated by dreams, meditation, and memory, DAVID LYNCH: THE ART LIFE is an appropriately foggy, yet intimate look at a man who has always been most comfortable in his own head and in his own studio. Ultimately an inspiration to artists -- and certainly to this Lynch fan -- the film is an enlightening, grotesque, and wonder-filled visit to the garden that has cultivated Lynch's craft and philosophy. But then again, as a Lynch-loving film nerd, I may be a little biased.